Most of the land in Maine that is covered with water is publicly owned. Historically, this public ownership dates back to Colonial times when these lands were reserved as a public trust. That is, everyone had a right to use them for "fishing, fowling (hunting), and navigation." These were considered essential public rights, and the State of Maine has retained these rights, and included public access and recreation, as have most other states. Piers and other structures located on submerged lands may be privately owned; the land and water beneath them are not. Administer Submerged Lands Leasing Program. Provide limited use leases and easements to allow piers and other structures to be built on and over Public Submerged Lands. Administer the sunken log salvage program. Offering opportunities for qualified companies and individuals to salvage sunken logs from publicly owned submerged lands. View the Sunken Log Salvage Rules (PDF 57KB). Coastal region (including islands): All land from the mean low-water mark out to the three mile territorial limit. Where intertidal flats are extensive, the shoreward boundary begins 1,650 feet seaward from the mean high-water mark. Tidal Rivers: All land below the mean low-water mark of tidal rivers upstream to the farthest natural reaches of the tides. Great Ponds: All land below the natural low-water mark of ponds that are 10 or more acres in size in their natural state. Boundary Rivers: Land lying between the banks of rivers that form Maine's border with Canada. Pipelines, utility cables, outfall/intake pipes, and dredging. 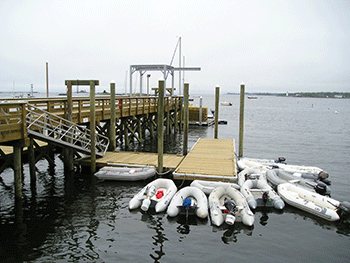 Services and facilities for commercial marine activities. The size and nature of the project determines whether a lease, which has an annual rental fee, or an easement, which has a registration fee, is required. The Bureau may place special conditions on the terms of a lease or easement when traditional and customary public uses are diminished. Projects may be required to include public walkways or boat ramps; navigational improvements; publicly accessible space for fishing, sight-seeing, waterfowl hunting, or recreation; and/or protection of important commercial fishing and water dependent activities. Structures that were in place prior to October 1, 1975 were granted constructive easements that expired on September 30, 2005. New leases or easements from the Bureau are required to legally occupy the submerged lands where the structure is located. Applications are available from the Bureau to replace constructive easements with a new lease or easement. Annual lease fees are set by statute and are based on the type of use, property values, and the amount of submerged land area occupied. The minimum annual lease rent is $150. Easements require a $50. registration fee every five years. Application Forms are available from the Bureau of Parks and Lands.